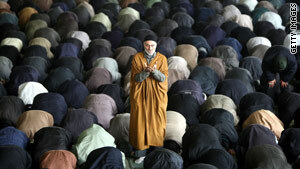 Iranian worshippers listen to a weekly Friday prayer at Tehran University. Washington (CNN) -- The State Department condemned Iran's persecution of religious minorities on Friday following the Iranian authorities' detention of Baha'is and Christians in recent months. Iranian authorities have detained more than 45 Baha'is in the last four months, and as many as 60 Baha'is are imprisoned in Iran on the basis of their religion beliefs, the State Department said. Iranians have also recently detained more than a dozen Christians, according to the State Department. "The United States is increasingly concerned about the Iran's ongoing persecution of Baha'is and other religious minority communities," said Philip J. Crowley, assistant secretary for public affairs, in a statement on Friday. The State Department's condemnation comes a day after it released a human rights report on Iran that blasted the country's government for abusing religious minorities, among other criticisms. "Government rhetoric and actions created a threatening atmosphere for nearly all non-Shia religious groups, most notably for Baha'is, as well as for Sunni Muslims, evangelical Christians, and members of the Jewish community," Thursday's report said. Iran is an Islamic Republic where Shia Islam is the state religion. The Iranian government did not respond directly to the State Department on Thursday or Friday. However, Iranian President Mahmoud Ahmadinejad criticized the West on Friday for ignoring religious principles like monotheism. At a meeting with Iranian intellectuals, "the president stressed that [many] efforts should be made to ... promote justice and support [a] campaign against oppressors and help monotheism flourish," Iran's semi-official Fars News Agency reported. Thursday's State Department report said that Iran's government prevents Baha'is from gathering in homes to worship and bans Baha'is from public schools, universities, the social pension system and government leadership posts unless they conceal their faith. All seven members of Iran's Baha'i national leadership body, who were arrested in 2008, remained in prison at the end of 2009, according to the report. The Baha'i faith was founded in Iran in the 19th century. Today, Baha'is are the country's largest religious minority, with 300,000 members, according to the official Baha'i Web site. Thursday's State Department report also accused the Iranian government of destroying a Sufi library and religious hall in Isfahan; demolishing several Sunni mosques; and requiring evangelical Christian groups to submit congregation membership lists to the government. The report was part of a broader State Department release of human rights reports on 194 countries.